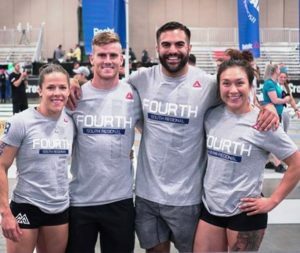 the birth of his first son, Gio and a team of three train for several hours a day with the goal of competing in the team division at the international CrossFit games. This past August the team did just that, as LoneStar qualified to compete at the Reebok CrossFit Regionals. Just 40 teams from all over the world are invited to compete. “I knew I would get here eventually. It has been one of my goals since I discovered CrossFit in 2013,” Contreras said, who’s also a U.S. Marine reservist and became hooked on the sport when he was stationed in Afghanistan. He’s accomplished this in just five years, though it has come with a lot of determination, after bouncing back from knee surgery, while also pursuing a higher education. Gio first attended college in 2008, but says he didn’t take it seriously and decided to join the military. He decided on returning to Vista because of small class sizes and the campus environment. In 2015, he earned an associate degree in accounting. Team LoneStar placed 25 out of 40 teams from around the world. They were the only team from San Antonio to earn a spot at the games.